On June 9, 2017, The Theater at Madison Square Garden will host Triumph Kombat 3. Triumph Kombat 3 is putting on a 19 bout fight card, which includes a mixture of Muay Thai and Mixed Martial Arts fights. 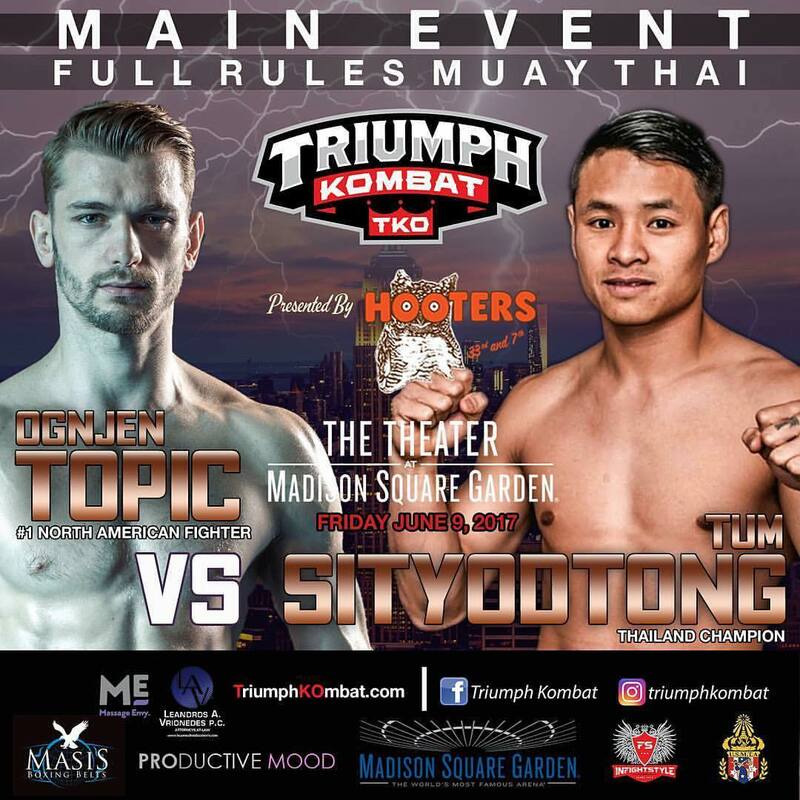 The main card is capped off with three title fights, and the main event is a professional Muay Thai fight between Tum Sityodtong and Ognjen Topic. Sityodtong is a Thailand Champion coming over to fight the No. 1 North American Muay Thai fighter. Doors to this historic event swing open at 5:30 pm and the first preliminary bout starts at 6:00 pm, followed by the main card at 8 pm. Triumph Kombat is sanctioned by a New York State Athletic Commission third-party sanctioning body, the United States Muay Thai Association (USMTA). Ognjen Topic, a resident of New Jersey, and No. 1 Muay Thai Fighter in North America is set to battle Thailand Champion, Tum Sityodtong. These two Muay Thai fighters will go war in hopes of wrapping the Triumph Kombat Professional World Title around their waist. Topic is the No. 1 ranked fighter in the USA in the Super Feather Weight Division. He is the current WKA North American Champion in the lightweight division and the current WBC North American Champion in the Super Featherweight division. Topic is also a Former Lion Fight World Lightweight Champion. Topic has been training at North Jersey Muay Thai (NJMT) since 2005 and in 2011 he was voted the North American professional Rookie of the Year by Muay Thai Authority. He was also voted Professional Fighter of the Month by the WKA (World Kickboxing Association) and Break Through Fighter of The Year by Muay Thau is Life website, in 2011. Topic was also awarded New Jersey Martial Arts Hall of Fame 2012 Fighter of the Year. In addition to all of Topic’s accolades, he earned the most “Fight of The Night” awards in the history Friday Night Fights. The entire fight card will be streamed live for fans, not in attendance. The prelims will be streamed live for free on Triumph Kombat’s Facebook page. My MMA News will have a link to the fights, HERE. The main card is a pay-per-view card that can be watched on Fite TV. Click this link to watch. The prelims begin at 6 pm sharp and followed by the main card at 8 pm. To see the entire fight card line-up, click here. Follow the action on MyMMANews.com for live results. Be sure to follow us on social media as well at @MyMMANews. Live Results will be posted in another article, HERE.